In early 1976 the OA National Bulletin reported that co-founder of the Order of the Arrow Dr. E. Urner Goodman and his wife were struck by a car while visiting in Sarasota, FL. Dr. Goodman received numerous cuts and bruises, but both were recovering nicely at home in Penney Farms, FL. 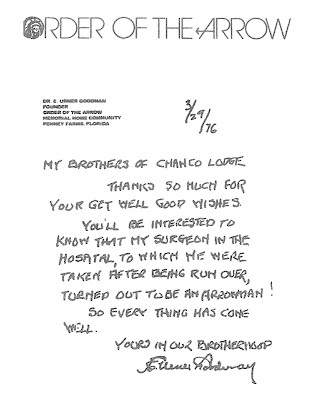 The considerate leaders of Chanco Lodge sent a get well note to Dr. Goodman, wishing him a speedy recovery. 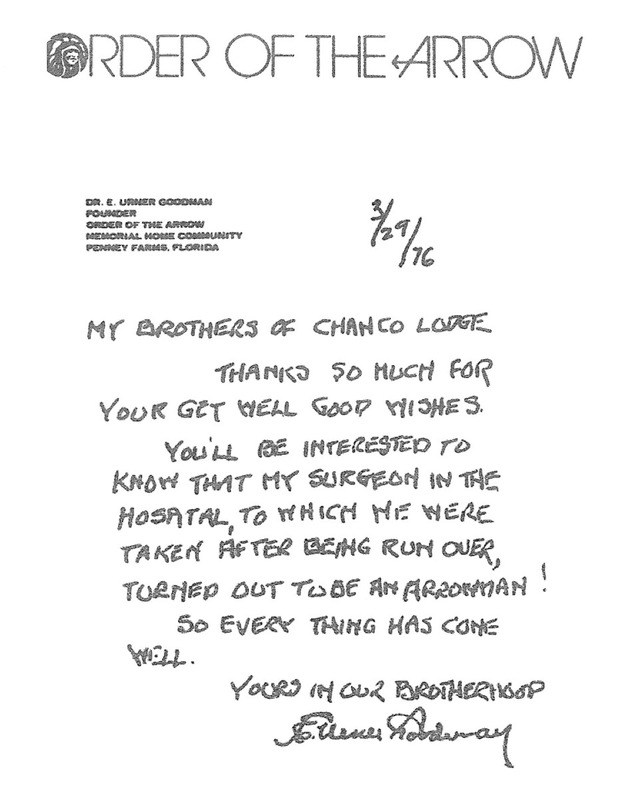 The ever-thoughtful Dr. Goodman responded with a thank you message which was published in the June, 1976 edition of the Chanco Courier and is pictured above. Can you imagine the excitement of the surgeon when he discovered that his patient was the famous founder of the Order of the Arrow? The patch above is from the first Christmas banquet I attended as a Kecoughtan arrowman. As I recall the patch was designed by Lodge Chief Andy Hess. There was a mug for the event, too. 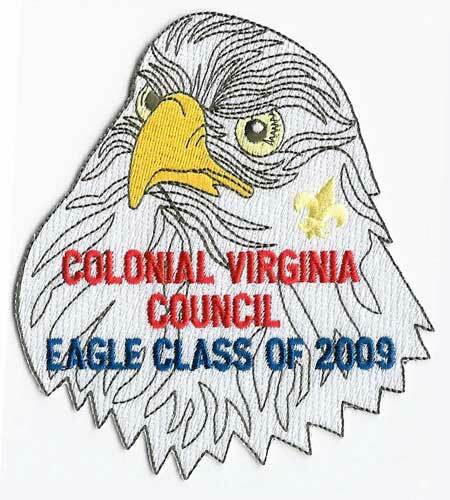 Although I didn't know it at the time, this was the very first Kecoughtan Christmas banquet patch. The only other items issued for a Christmas banquet prior to this were a neckerchief slide for the banquet in 1967 and a coffee mug in 1969. Check out the article I wrote about the banquet and the awesome pictures by Gary McSmith in the March, 1974 edition of the Kecoughtan Kryer. Andy is wearing the patch above in one of the pictures, and you can even spot a picture of me with much more hair than I have now! 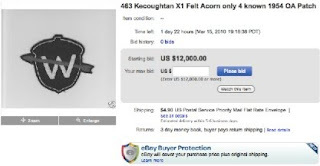 My sincere thanks to everyone who has contributed to help document the history, emblems, and traditions of Kecoughtan, Chanco, and Wahunsenakah Lodges and the Order of the Arrow in Virginia. Kecoughtan Lodge hosted their first Area Pow Wow in 1972, the year that the Lodge was celebrating their 20th anniversary. For decades I have always thought that the numeral "20" in the Pow Wow patch design represented this. 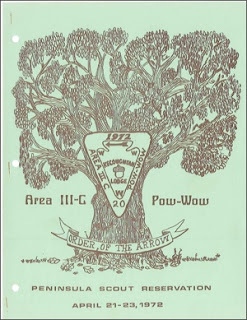 Recently Ben Vincent provided me with a PDF copy of the 1972 Area III-C Pow Wow booklet. 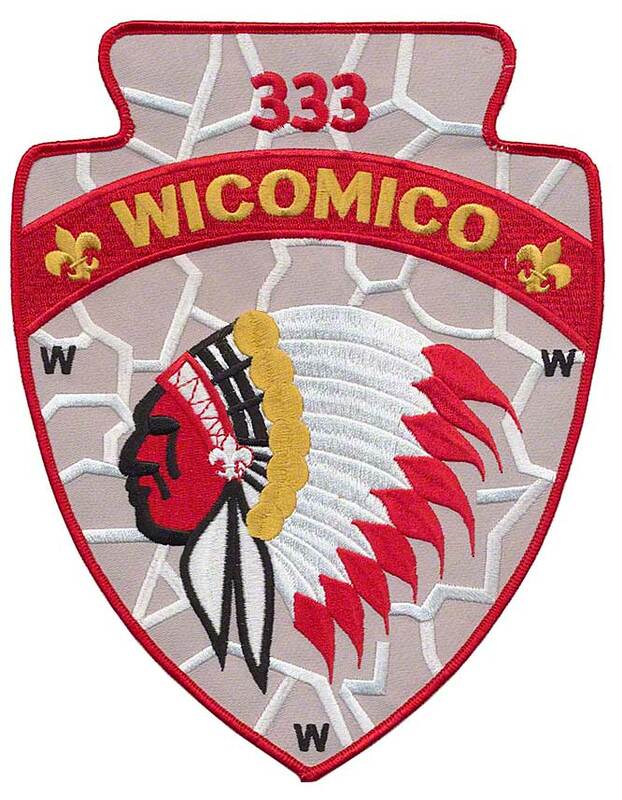 Among other insights, I learned that the "20" on the patch actually represents the 20th Area III-C Pow Wow. "It is truly a privilege for the Brothers of Kecoughtan to serve as hosts for the 1972 Pow Wow. Arrowmen from all parts of the Peninsula have spent many hours in service to prepare for this weekend. If it is a success, then those dedicated Arrowmen deserve much credit. If there is some aspect that does not appear to be a success, then assume it to be a new experience." Another favorite part the booklet for me is the illustrated front and back cover that pictures an oak tree with the Pow Wow emblem superimposed. Hidden in the leaves is the name of the illustrator: Dave Tudder, youngest son of the Lodge Advisor. I am sorry to report that Dave passed away a few years ago according to his brother John, so I was unable to share my appreciation for his efforts with him. 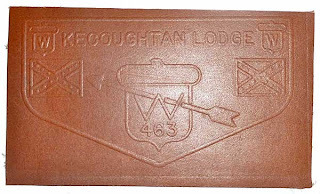 Take a few moments to read the booklet and enjoy a trip back to Peninsula Scout Reservation in 1972 when Kecoughtan Lodge was deservedly proud of being a National Standard Lodge. 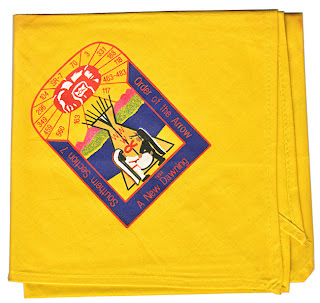 On December 4 Wahunsenakah Lodge 333 held their annual Christmas Banquet, described in a prior post about a cloth version of the 2010 BSA 100th Anniversary flap that was sold there. 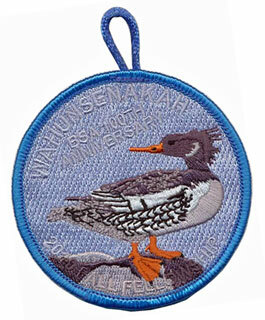 No to be overlooked is the fifth and final patch in the 2010 series of activity emblems for Wahunsenakah Lodge. 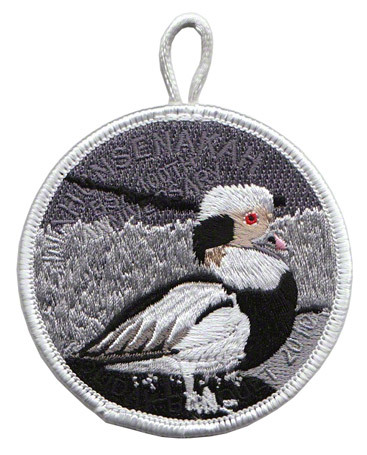 The three inch round emblem with pocket loop follows the style of prior issues from this year with ghosted lettering that emphasizes the attractive design of a predominantly black and white duck on a monochromatic background that evokes a winter atmosphere. I was so fascinated by the unique duck on this patch I spent some time on the Ducks Unlimited Waterfowl ID page trying to identify the species. Since I couldn't match it perhaps an expert can help me out by posting the answer in the comments. You can view this and all of the Wahunsenakah event emblems on the Lodge 333 Activity Emblems page. Thanks to Larry Johnson for the patch and for advising me the designer of the 2010 Wahunsenakah activity patches is Alan Booth. Not long ago I got to wondering about a particular activity patch in my collection and decided to spend some time researching its origins. 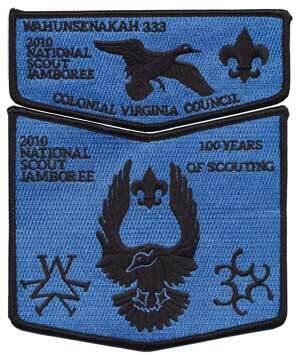 It came to my collection as part of a group of Kecoughtan event patches I acquired. It's not rare or valuable by any stretch, but I learned it holds a very special significance not only for lodges 463, 483, and 333, but represents a unique beginning that even Arrowmen of today will appreciate. 1995 was a year between NOAC events. The National OA committee implemented a program called the Year of Service and encouraged every lodge to perform a service project approved by their Scout Executive to earn special recognition. 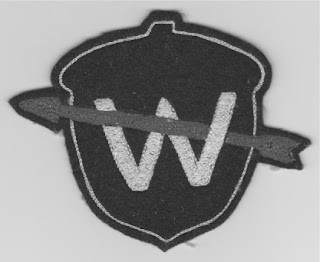 A special patch was available for Arrowmen participating in the service project. 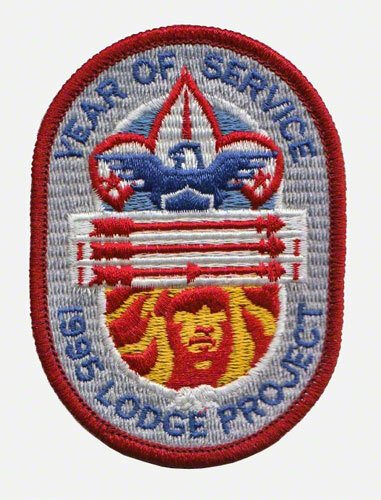 The April-June 1995 edition of the OA National Bulletin featured an article encouraging Lodges to participate in the program, with details and a picture of the patch. The National OA Committee also encouraged Lodges to apply for matching grants to help fund their service projects. A front page story in the January-March 1995 edition of the OA National Bulletin advised that 152 lodges submitted requests. While $25K was originally set aside to fund the approved projects, the Committee selected 19 Lodges to receive a total of $58,111 in matching grants for their projects. The only Virginia lodge to receive matching funds was Shenandoah 258, which was granted $4K to assist with building a handicapped campsite. As part of the Year of Service Kecoughtan and Chanco Lodges shared a joint service project on the weekend of Nov. 4, 1995. In the September 1995 Chanco Courier Lodge Chief John Belmonte invited Arrowmen from his Lodge to attend the joint service project to be held with Kecoughtan Lodge to rebuild the chapel at Camp Chickahominy. The October, 1995 Kecoughtan Kryer also encouraged members to attend, cautioning that only 60 patches would be available for the project participants. The April 1996 edition of the Duck Calls newsletter reports the project was completed March 1-3, 1996 at the Winter Ordeal of the new Wahunsenakah Lodge that was formed by the merger of Kecoughtan 463 and Chanco 483 on January 1, 1996. According to Duck Calls a highlight of the weekend was snow and an attendance of over 200 brothers. Former Chanco member Dewitt Holland remembers that he served on the kitchen staff and all the boys were moved into the dining hall for the night in anticipation of the arriving winter storm. Seeking quiet, he elected to sleep outside and awoke under a tent sagging under two inches of snow. The patch is not listed in the activity emblems catalog for either lodge in collecting resources like the Blue Book, but represents a significant service event as Arrowmen from southeastern Virginia began their project as members of Chanco and Kecoughtan Lodges and completed it as brothers in the new Wahunsenakah Lodge 333. As part of the Year of Service the National Committee also launched the Philmont OA Trail Crew project. 270 Arrowmen from across the country were selected to spend 14 days at Philmont during the summer helping construct a new trail. This new initiative was an important seed for future high-profile service efforts by the OA, first at other BSA national high adventure areas and later on public land throughout the US. The ambitious ArrowCorps5 in 2008 was the largest service project conducted by the BSA since World War II, involving over 3,600 Arrowmen in 5 national forests across the country. Today the seed planted back in 1995 continues to grow as the National Committee plans SummitCorps for summer, 2011 at the New River Gorge National River Area in West Virginia. The lesson I learned after completing my research: don't judge a patch by the monetary value you find on a price list or its nondescript generic design. The fun in patch collecting is learning and appreciating the unique background behind the emblem. The Wahunsenakah Lodge Executive Committee will vote on a design for a new lodge neckerchief at their meeting scheduled for December 4. 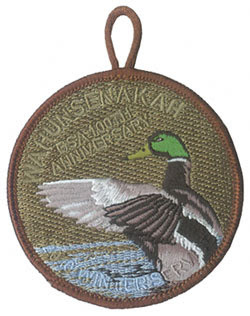 The first Wahunsenakah neckerchief features a single duck design embroidered directly onto a dark green neckerchief. It was first sold in 2001. 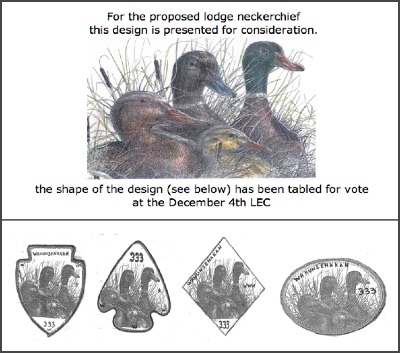 Above is an illustration from the Lodge web site of possible designs the LEC will be considering for the new neckerchief. 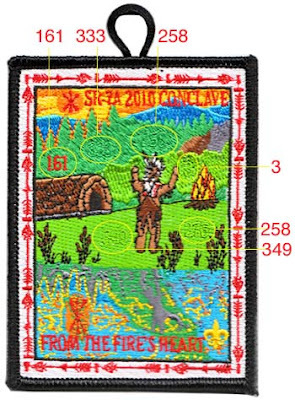 While researching a new article about an activity patch today I came across a great online resource that may prove helpful to others who are interested in the history of the Order of the Arrow. It's an official site of the OA, though I was not able to find any reference to it on the official OA BSA site. 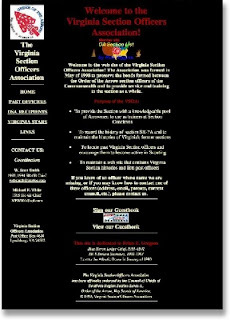 Although the site requires a search to bring up any content, the results are treasures for those seeking scanned copies of old National OA Bulletings, pictures of event patches, and much more. You can search by keyword, date range, and much more, or to just get an idea of what's available click the random images button. 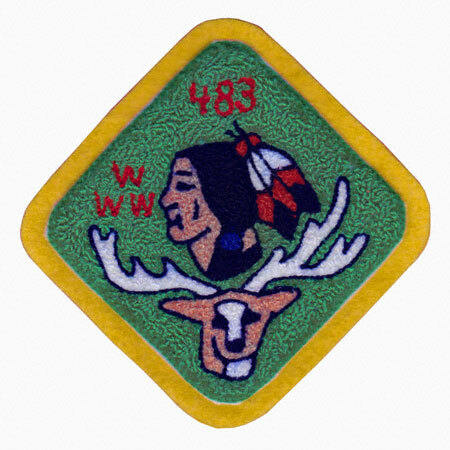 Wahunsenakah Lodge held their Fall Fellowship at Bayport Scout Reservation on October 29-31, and issued this beautiful patch to commemorate their weekend of cheerful service. 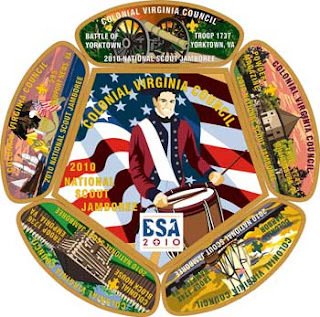 Following in the style of the previously issued activity patches for 2010, the design features ghosted lettering across a multicolor background and recognizes the 100th anniversary of the BSA. Last week I traveled to Virginia for a Kecoughtan High School reunion for classes that graduated in the 70's, and afterwards took my family to Washington DC to see the sights. Along the way we stopped in Fredericksburg so that I could check out the Trade-O-Ree and meet trading friends face to face that I previously only had the pleasure of knowing via email. One of the great friends I was happy to meet in person was Michael McCaughan who helped me add a Chanco F1 to my collection along with an item I've never seen before: an uncut Kecoughtan leather flap. Michael actually had three uncut 463 leather flap emblems in his possession, all with slight variations in the depth of the stamping and the color of the leather. 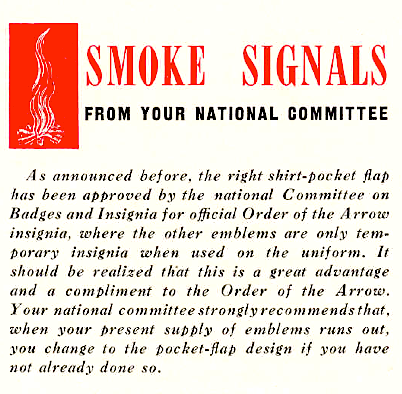 He also related information about the production of the leather flaps he received from a former Kecoughtan member that corroborates what I have heard from others, namely that the leather emblems were stamped out informally at lodge events, not created and sold as an official issue. Section SR-7 was formed in April of 1993, immediately after the final conclaves of Sections SE-7 and SE-8, as part of the national realignment of the Order of the Arrow from 6 national regions to 4. 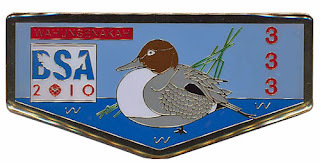 The 7 Virginia lodges that comprised SE-8 were split, with Tutelo, Shenshawpotoo, and Shenandoah Lodges moving to the new SR-6, and Kecoughtan, Blue Heron, Nawakwa, and Chanco combining with no fewer than 10 North Carolina Lodges to form SR-7. The first conclave of the new Section SR-7 was hosted by Keyauwee Lodge 70 on April 15-17, 1994, at Old North State Scout Reservation, (now Cherokee Scout Reservation) near Yanceyville, NC. SR-7 patches are not plentiful, since few were issued and the Section only lasted 4 years before a national realignment on January 1, 1997 reunited the Virginia Lodges into the new Section SR-7A. 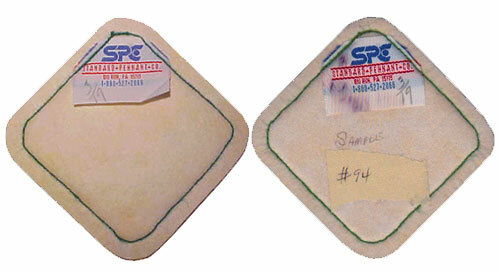 As a result there are only about a dozen patches from the short-lived Section SR-7. I was fortunate recently to add a neckerchief and jacket patch from this 1994 SR-7 conclave, and a jacket patch from the 1996 conclave hosted by Blue Heron to my collection, and you can find images of them on the SR-7/SR-7A web page. If you are aware of any other issues from SR-7 that I don't have listed please let me know! Credit to Robert Higgins' indispensable OA Section List web site for documenting the many and complex realignments of OA lodges throughout its history. Advisor George Homewood sent along this updated design for the proposed Wahunsenakah Lodge flap that will be issued for the upcoming Section SR-7A Conclave to be hosted by Tutelo Lodge April 23-25. The original design did not receive approval from BSA due to licensing concerns about the Pac-Man styled components, so they have been removed. Recent heavy snowstorms along the East Coast have caused cancellation of the Lodge 333 Winter Service event originally scheduled for February 26-28 at Bayport Scout Reservation. 3 Beaver Days have been scheduled as a replacement before the Lodge's Spring Service weekend on May 14-16. To help raise money to fund the needed repairs at Bayport, we will sell the already produced Winter Service Weekend patches for $5 each with all money being used at Bayport. 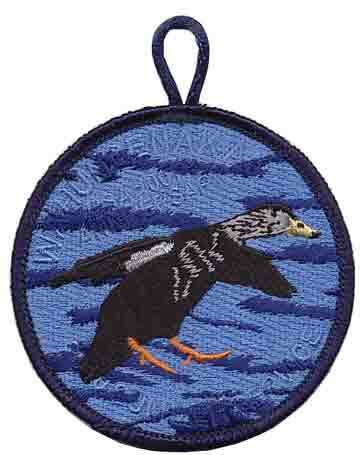 We plan to have the patches at the 3 Beaver Days as well as at the Spring Service Weekend until the supply is gone. 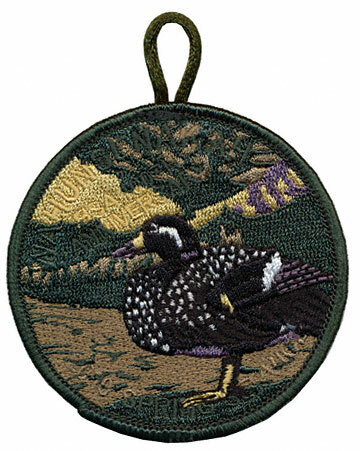 The patch is the first of a series of 3" round event patches for 2010 featuring wildlife duck scenes with lettering "ghosted" into the design. I think you will agree these are some of the most beautiful patches the Lodge has ever produced. Thanks to George Homewood for the picture of the patch.